Every southern girl has certain things tucked away in her little bag of “tricks”. Rituals, traditions, and mannerisms she was taught while growing up. They are the unspoken rules of the south, and we take pride in passing them down. Rules you hear from the time you are a toddler: Give Me-maw sugars, call your mamma, say grace, mind your manners, be welcoming to guests, don’t return a dish empty, write your own thank you notes. Always have a little black dress, pearls can go with anything, and don’t let your roots show too long. 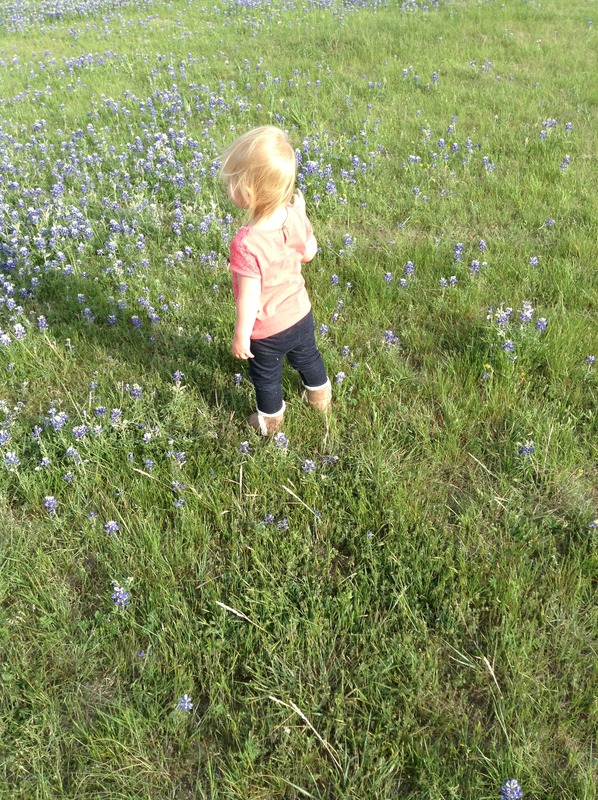 Take Easter pictures in the bluebonnets, serve watermelon for 4th of July, and don’t forget your friends’ birthdays. Work hard, do good, and don’t brag about it. Learn to fry a chicken, guard your pecan pie recipe, and have a go to casserole. 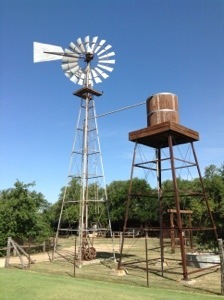 Around here it’s all about Faith, family, taking care of those you love, and being the best version of yourself. The other thing a southern girl understands is the need for good, strong women in her life. Two women that I love dearly who happen to possess all those wonderful southern attributes also share the same birthday. In honor of these lovely ladies, I am celebrating one of the most humble yet satisfying meals, the casserole. Every southern girl I know has a casserole committed to memory that they can assemble at a moments notice -pot luck, friend had a baby, or someone has a death in the family. The concept of this recipe came from my bestie. She is a saint. In fact, she may already have a saint named after her. I’m not sure…I’m not catholic. She is, so she would know. Any who…She has been my best friend forever. Literally, since birth; I cannot imagine life without her. She’s been here good, bad, ugly, and wonderful. She’s my cheerleader, sounding board, and tough love. She stayed with me in the hospital with my second baby when he was just days old and I had a nasty infection. She loves my kids like she loves her own. She brings me flowers. She brings me chicken spaghetti. What can I say, she gets me. It ain’t pretty, but it sure is good. This version is old school, no canned soups here! 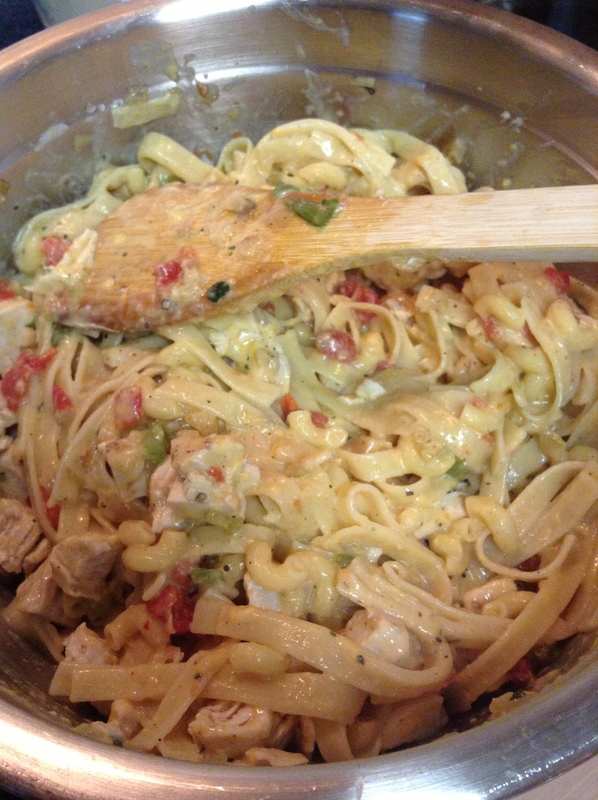 If you like it more on the soupy side, half again the sauce portion as the noodles absorb a LOT. Place chicken and generous sprinkling of salt in a deep pot. Fill a pot 2/3 full of water. Bring water and chicken to boil, reduce to simmer, cover and cook 20-40 minutes until chicken is cooked through. Use tongs and remove chicken pieces. Allow them to cool, cube, and place in a large bowl with the Rotel. While chicken is cooling, return water to a boil and cook spaghetti in the chicken liquid until al dente. Reserve 2 cups of the chicken cooking liquid before draining pasta. 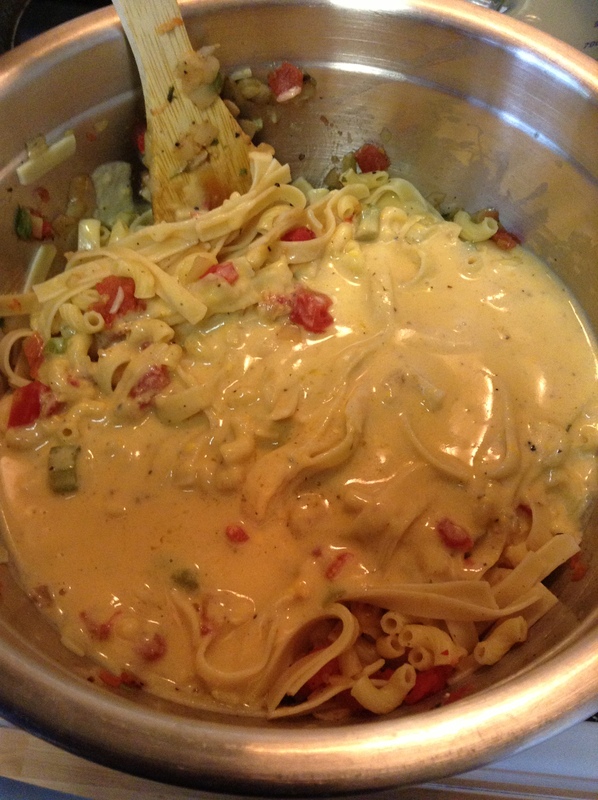 After draining, add the pasta to the chicken/Rotel mixture. 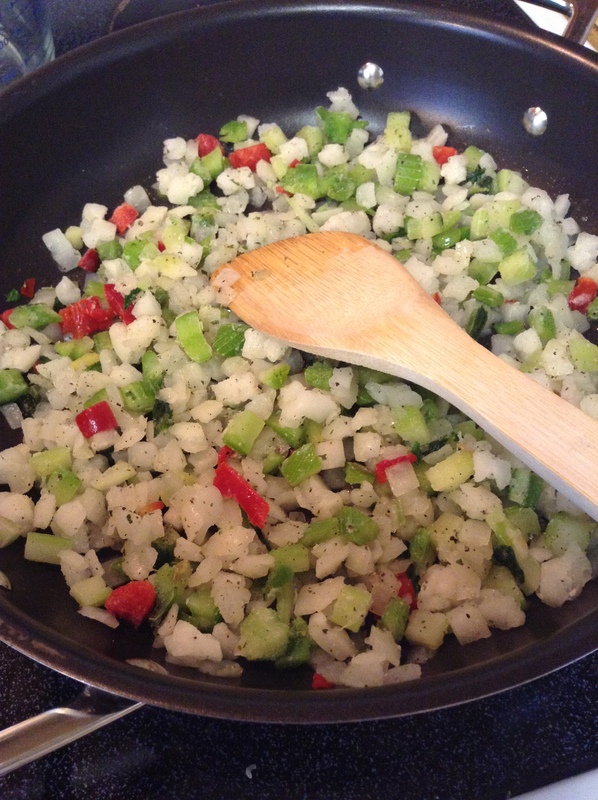 In a sauté pan, melt 1 tablespoon of butter, add onion and both peppers and sauté until softened. Add this to the chicken/pasta/Rotel mixture. Make the sauce: Melt 4 tablespoons of butter in a sauté pan over medium heat, add 4 tablespoons flour, and cook the flour and butter to create a light rue. Whisk in chicken cooking liquid. Then whisk in warmed milk. It should thicken slightly. Season to taste with cayenne, salt, pepper, chili powder and garlic powder. Reduce heat slightly and slowly melt in 4 cups of sharp cheddar and the queso/American cheeses. Preheat oven to 350 degrees. 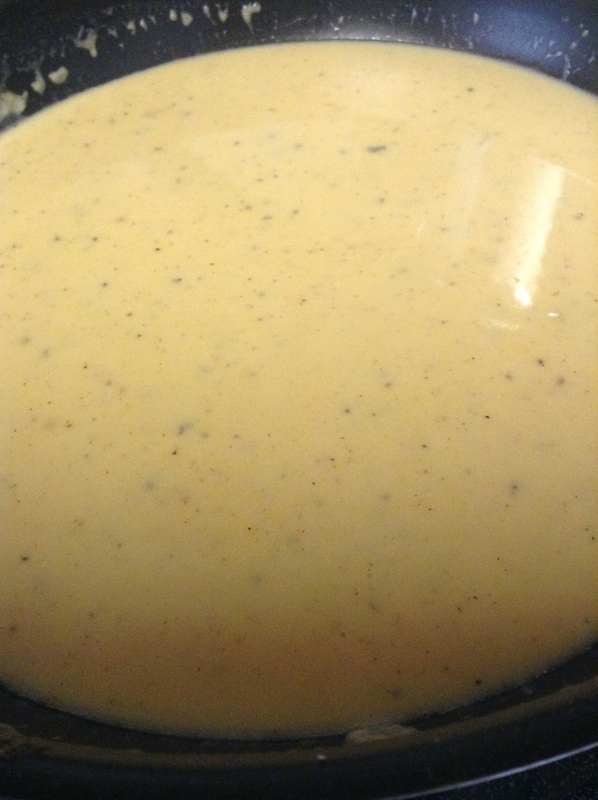 Pour the sauce over the mixture in the bowl. Fill into one 9X12 greased pan or 2 8X8 greased pans, cover with foil, and bake 30 minutes until bubbly. Remove foil, top with additional ½ cup of sharp cheddar and bake 10-15 minutes until cheese melts. One pan for you, and one to share. This makes a good dish to take to someone. Just cover in plastic and foil, freeze and tell them to bake it a little longer. Save the second pan for yourself…needless to say, there won’t be leftovers. YUM! One of these days I think I’m going to try adding sautéed mushrooms, but Boogers doesn’t like them, so I’m going to have to wait awhile. My mother in law’s signature casserole is the Mexican Chicken Casserole; although she makes a mean lasagna. The name in no way is a reflection of what it actually is, as no Mexican or for that matter anyone of Latin descent actually makes it. I have taught and worked with many people from south of our border over the years and all agree, Tex-Mex is not Mexican. Maybe I should be p.c. and rename it Texican Chicken Casserole…It’s often called King Ranch chicken, a much more logical name since Texas does have a King Ranch. They even have a saddle and leather shop that makes gorgeous things. 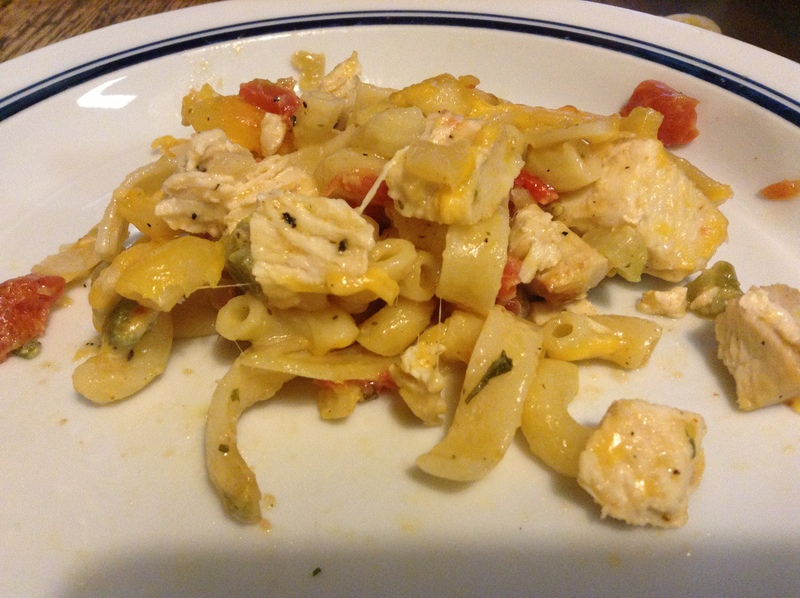 It is yummy, creamy, cheesy, and slightly spicy. I do make my version slightly different from Man’s mom, but I’m grateful to her for sharing with me. I love that lady! God smiled on me when he chose Man’s family. I serve it with sour cream, salsa, and a side of guacamole. 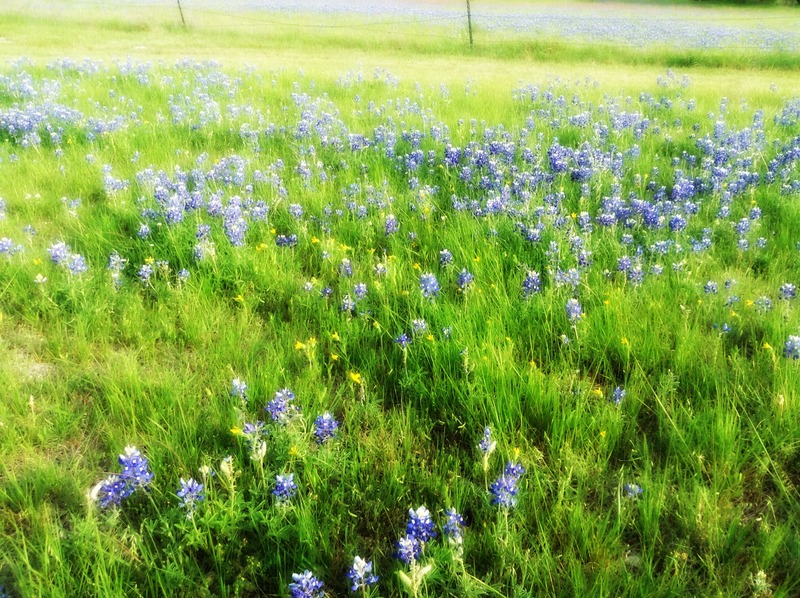 Now if that’s not Texan, I’m not sure what is. Currently I make this dish with canned soup like my mother-in-law does. One of these days, I may get around to changing. Probably not, but maybe. 4 cups chicken, shredded or diced – You can boil one and shred the meat (if you do, reserve some of the stock), use a rotisserie chicken from the deli, or some leftovers from the grill. I think the best is a mix of light & dark meat. Sauté the onion, bell pepper and onion in a little butter. In a separate bowl, combine soups with stock and Rotel to make your “sauce”. Mix very well. Then begin layering the casserole starting and ending with a layer of sauce (sauce, tortillas, handful chicken, sprinkle of pepper mixture, handful shredded cheese, pinch of salt, pepper and chili powder, tortillas, sauce…). Reserve 1/2 cup of cheese. Bake covered at 350 for 30-45 minutes. Top with remaining half cup of cheese and continue to bake uncovered for another 15 minutes or until bubbly and cheese is melted. 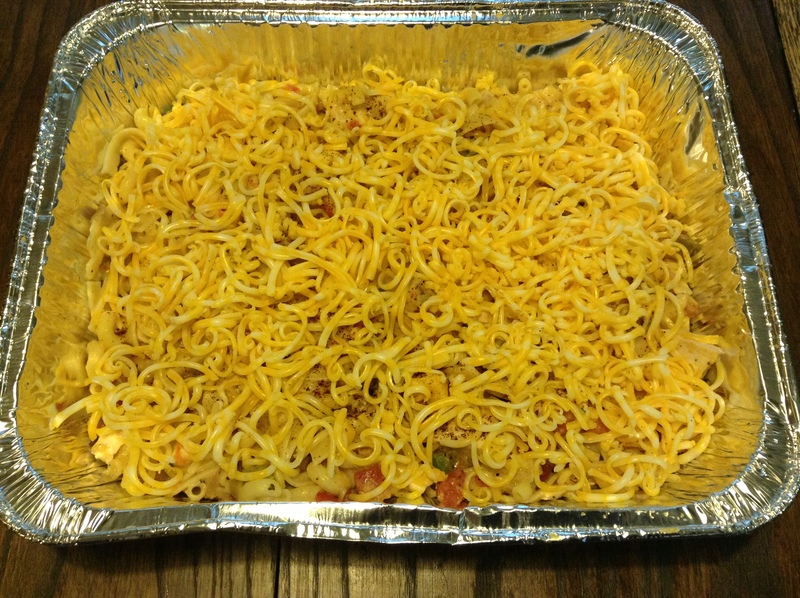 My latest favorite casserole – just a little spicy. This was originally a Meatless Monday recipe I found on Tastebook, but there wasn’t a lot to it. It would have made a great dip, but a meal….not so much. I live in Man-land, so we must have MEAT! So, I added chicken, changed up some stuff, and here is what you get. 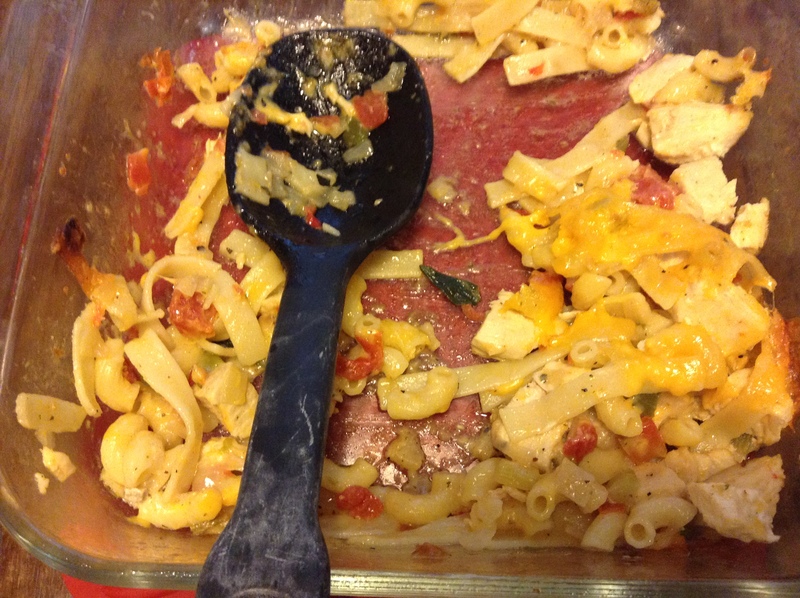 Hmmm….maybe I should add chicken to spinach artichoke dip and call it a casserole. I doubt it would get many complaints. Preheat oven to 450 degrees. Place peppers directly on rack in oven and roast until charred on all sides. Remove to a bowl and cover tightly with plastic wrap. Allow to cool until able to be handled. Wear disposable gloves to do this next part, so you don’t accidentally scorch your eyes later in the day. Peel the skin off each pepper and slit in half lengthwise. Remove and discard seeds. Then chop or slice the peppers to your liking. Lower the oven to 350 degrees. Lightly spray a 1 1/2-quart casserole with no-stick spray and set aside. While the peppers roast, make the sauce. Heat oil in a large skillet over medium heat; whisk in flour and chili powder to make a roux. Cook while whisking until lightly browned. 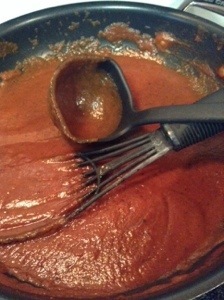 Gradually whisk in tomato sauce, broth, cumin, garlic powder, onion salt, salt, and oregano. Stir until smooth, and continue simmering over medium heat about 10 minutes, or until slightly thickened. In a medium bowl, beat together the milk, egg whites, and flour until smooth; set aside. In another bowl, combine the Monterey Jack and cheddar cheeses. Set 1/2 cup of this cheese mixture aside for the topping. 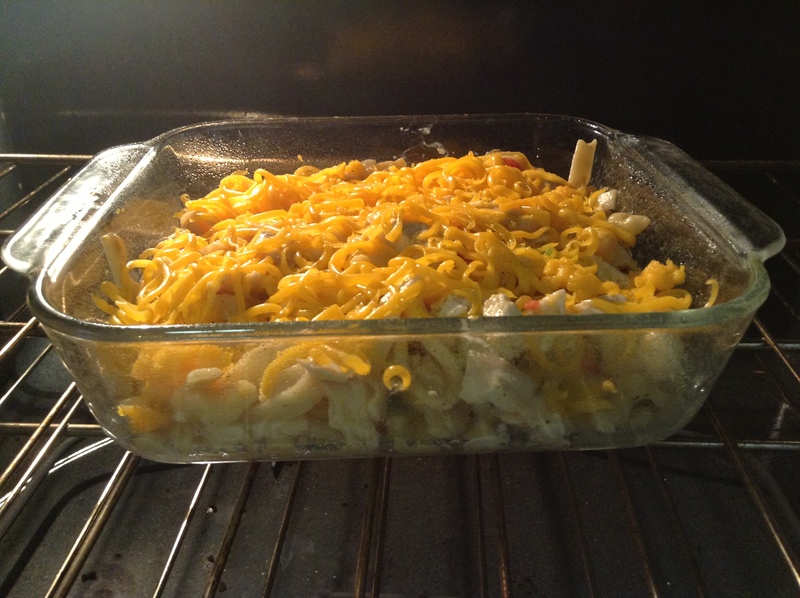 To assemble the casserole, ladle some sauce on the bottom of the baking dish. 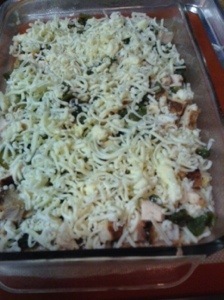 Then layer half each of the chili peppers, chicken, the cheese mixture, and egg mixture. 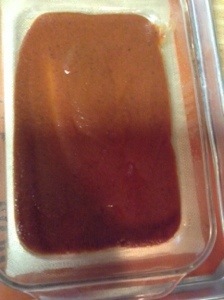 Top with half of the sauce. Repeat layers. Pour the remaining tomato sauce over the top, cover, and bake 30 minutes. Remove foil, sprinkle with reserved 1/2 cup cheese mixture, and bake about 20 minutes more or until knife inserted near top comes out clean and cheese is melted. Now for some red velvet cake to celebrate. Off to wish my BFF a happy, happy birthday and give my mother in law a big oil’ birthday hug.